How much sunlight will be blocked by the overhang. Our cabin is 13115. Not as severe at the recessed, I understand, but it looks like we should get some sun. Would u recommend I keep. It? We do like the location. Your information has been invaluable. I cruise a lot, but you offer information above and beyond anything that I have seen. Could I have information on room 8102. A standard balcony cabin in size, 192 sq ft with a 42 sq ft balcony, with a good view of the life boats. That cabin is not at all affected by the overhang as there is no overhang on the stern hump. it's near enough to some lifts but with very few cabins further back should have little noise from passing footfall. It is a looooooong way to the theatre, at least a quarter of a mile round trip. No public areas above or below so no nasty surprise noise issues. I'd be happy to sail in that cabin as i don't have mobility issues. Just booked the Divina for next June. It's a GTY Fantadtica Experience balcony so I'm assuming this will be a B2. Are all B2s the same size or are some standard and others superior? 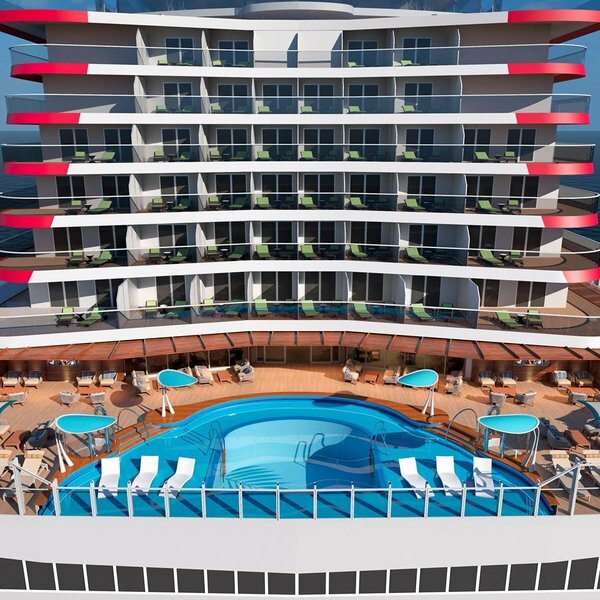 No - if you look at the deck plans starting from Winter 2014 you can see the cabins colour-coded for the different "Experiences" . Check out cabins numbers 13127 & 13129, for an example of differing sizes. the first has a sofa, the second doesn't. I know this from experience on Preziosa - I was in 13139, smaller cabin - no sofa. Smallest balcony cabin I've had yet on a Fantasia class ship. Hi Beam/ Amo ... Had a look at the 2013/14 brochure i have here and the colour codes are the same as cruisedeckplans, Blue for B1, Green for B2 and Mustard/Yellow for B3. On deck 9 of Divina the cabins Bea mentioned on 13 are B1 cabins yet the very same size cabins on Deck 13 are B2 ! so i can only guess that the Deck 13 cabins are B2 Fantastica due to being higher up the ship despite being smaller in size. Not sure where the Superior bit comes in though unless as i say it is due to being higher up the ship. I wonder where that "superior" description originated. It doesn't seem to apply to a specific class of cabin, ever! Pete (Skier 52) is right to refer back to the older categories when determining cabin sizes, etc. They were far more "honest" in distinguishing differences. Hi Bea ... I think the Superior would be better suited to those cabins with a settee in them and class the rest as B1 ie those without a seating area, the same goes for the inside and Ousides, the I2`s, O2`s and B2`s are all higher up the ship than the others apart from the B3`s. I find it hard to see how those you mentioned could be classed as Superior cabins unless it is because they get Free room service and the other bits of the Fantastica experience. Only MSC could go from lots of categories to three and then complicate them further by adding the Experiences. I've just had a look at the pre and post experience deck plans and the Fantastica ones are the same colour code as what was B2. Bella is B1 and Aurea B3. However I was thinking the b2s would be the slightly bigger ones with the sofa. Not the case. Some have a double sofa, some the smaller sofa and some no sofa at all (and only some of those are due to it being a connecting cabin). All very mystifying why there should be such variation within the same category. It is all academic anyway at this stage. Until they allocate a cabin number, I could basically have pretty much anything! No wasa Black Card member, I'm entitled to best available upgrade but how will they work that with the new experiences? Do I have a shot at getting an Aurea cabin or only better within the same category and how do they determine what is better? Not that I've had an upgrade to date! LAST MINUTE BOOKING DIVINA 12093. shall I take this? pro/con? About to book the Divina cabin 10218 (10216 is also available). Just wondering if anyone has any information about it. I have read that some cabins are smaller than others. Hoping this is a regular size with sofa. I have seen pictures of the overhang and angled balconies, which this is, and this is okay. Is there a way to figure the cabin size by looking at deck plans? This will be our first with MSC! Looking at the deck plans, neither have a sofa. Both have an angled balcony with 10218 having a much larger one. This is one of the balcony cabins with the big angled balcony. You only have cabins below and above you. You are near a back of lifts. Not sure if you'll be impacted by the overhang on that deck. You'll need to wait for our resident expert Pete (Skier) to come on to be certain. sorry to bother again but also have option of 12088. any thoughts?? No sofa either and standard size balcony. I'd personally go for 12093, but that's just me. I don't know which route you're on and whether you prefer to have more or less sun directly in your balcony. On some routes one side gets more than the other. Check out the deck plans and see for yourself what suits you best. 12088 will have a sofa - it's the cabins on the "hump" which have insides opposite them that don't have a sofa due to extra space needed to accommodate the extra insides. They also have smaller balconies. Hello, does anyone have a pic of what a cove hull steel balcony looks like on the Divina (up close). I am booked in room 9037. Do you know if there is a sofa couch in there and if there is a bathtub? I was informed that it is a B2. Thank you in advance. Any info on 11120? Thanks in advance! Cabin size 191sq ft and your balcony 42sq ft and its a connecting cabin.